The first ever Maldives Marine Science Symposium was held on October 27th 2016. We collaborated with the Maldives Marine Research Centre, IUCN, Maldives National University, UNDP and USAID to make this event happen after 10 months of planning. 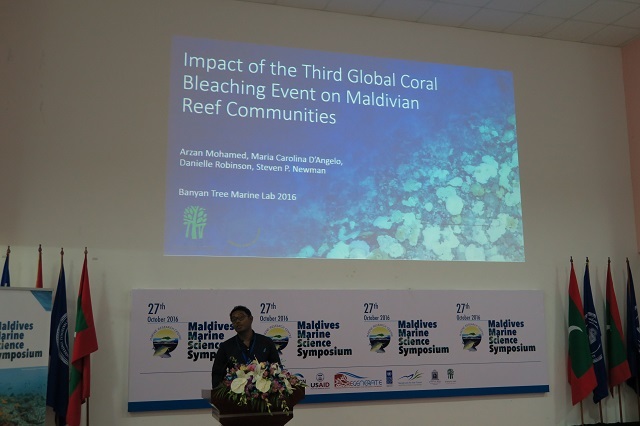 The symposium brought together over 100 marine biologists, researchers, conservationists, ministers and public and private sector managers from across the Maldives. Almost 30 presenters shared their research findings on a range of themes. Our team presented findings from some of our 2016 research projects including impacts of this years’ bleaching, efficacy of restoration efforts and the first socio-ecological assessment of shark populations in the Maldives. The event was a resounding success and the next one is planned for July 2018. We hope this will be a regular fixture in the Maldives and the first step towards unifying conservation efforts in the Maldives, bringing everyone together to promote experience and knowledge sharing.